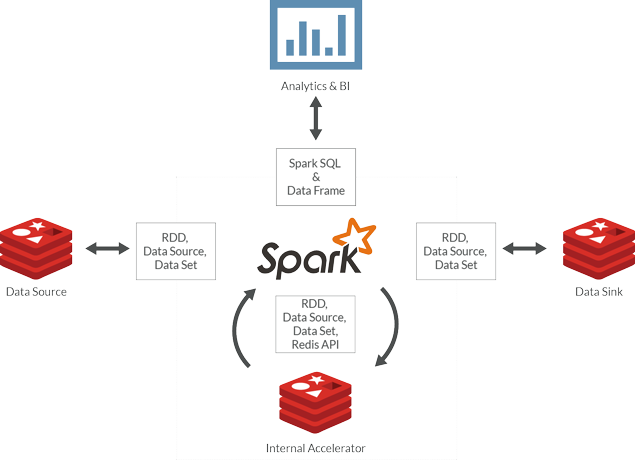 Databricks’ cloud-based Spark workspace integrates with Redis Enterprise Cloud, enabling Databricks users to serve Spark processes and SQL queries with Redis Enterprise Cloud and allowing Redis Enterprise Cloud users to instantly run analytics processing using Databricks’ cloud-based Spark clusters. Customers benefit from being able to access the power of Spark integrated with the real-time high performance of Redis. Analytics can shift from being post-facto to inline and instantaneous with the combination of these two powerful big data engines. Databricks’ cloud-based Spark workspace users can use Redis Enterprise Cloud seamlessly to serve Spark processes and SQL queries. See an example in this notebook.